Time is always of the essence, especially when it comes to your business. Instead of wasting valuable time erasing and re-drawing hand-drawn circuit timing charts, get it back with the Timing Diagrammer Pro. 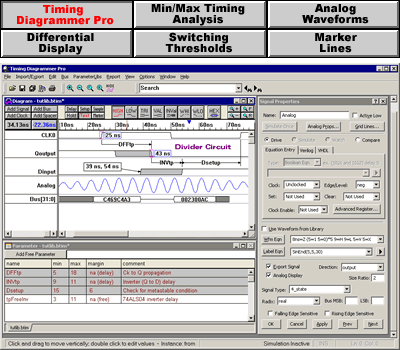 Timing Diagrammer Pro has everything that you expect in a timing diagram editor: a modeless drawing and editing environment; delays, setups, and holds for performing timing analysis; time markers; seven graphical waveform states; virtual and group buses; clocks with formulas; as well as a variety of ways to document your work. A great timing analysis tool at a great price, Timing Diagrammer Pro is a must-have for any engineer. With Timing Diagrammer Pro you have full control over how waveforms and timing data are displayed. You can choose to draw the waveforms, generate them using an equation, or import the data from a VCD file. You can change the waveform display by adjusting the line thickness, edge angles, color, and line style. Then annotate the waveforms using Time markers, Delays, Setups, and Holds. Our timing diagram software Pro uses several different timing analysis algorithms to ensure that timing is accurately calculated. Delays that are common to two converging paths are automatically removed. Clock jitter and clock buffer delays are correctly modeled. And skew removal can be modeled to create the fastest FPGAs. Analog waveforms can be displayed as either continuous analog signals or as digital valid segments. Waveform data can be imported from and exported to several different SPICE formats. Digital bus signals can be quickly generated and filled with data by using the Waveform Equation and Label Equation features. Functions can also operate on every state in the waveform, to quickly shift the timing around. Timing Diagrammer Pro also supports many display features that allow you to produce professional documentation of timing diagrams. Sections of the timing diagram can be highlighted to pin point important details. Time markers can be displayed as loops to show repetitive sections. Text can be added and attached to edges or waveforms so that it moves with the waveform as user zooms and scrolls around. Timing Diagrammer Pro can also be operated in a command line mode to quickly convert files and run scripts on waveform data files. Our Time Diagrammer is a step above the rest. With easy-to-use features, and adaptability, engineers love working with us. Just take a look at our reviews! Philip Nowe, a WaveFormer Pro user, wrote the article Timing (Analysis) is Everything: A How-To Guide for Timing Analysis for Circuit Cellar magazine describing the importance of timing analysis and some of the techniques and tools available for doing timing analysis. This article answer questions such as: "what is timing analysis? ", "why is timing analysis important? ", and "how do you perform practical timing analysis?". Would you like a quick walk-through of Timing Diagrammer Pro? Download the evaluation version, call 540-953-3390 and ask for Gary. He will give you a brief tour which covers important areas like: drawing waveforms, creating multi-bit buses, documentation techniques, and working with parameters.